Click here to see more shots for Faces by The Sartorialist. I agree…a great choice for her face! She rocks those glasses very well!!! Love her glasses, her hair and her coat! Love the LV bag on her! Love the bold printed glasses! Love her style…she makes me want to be a better man. 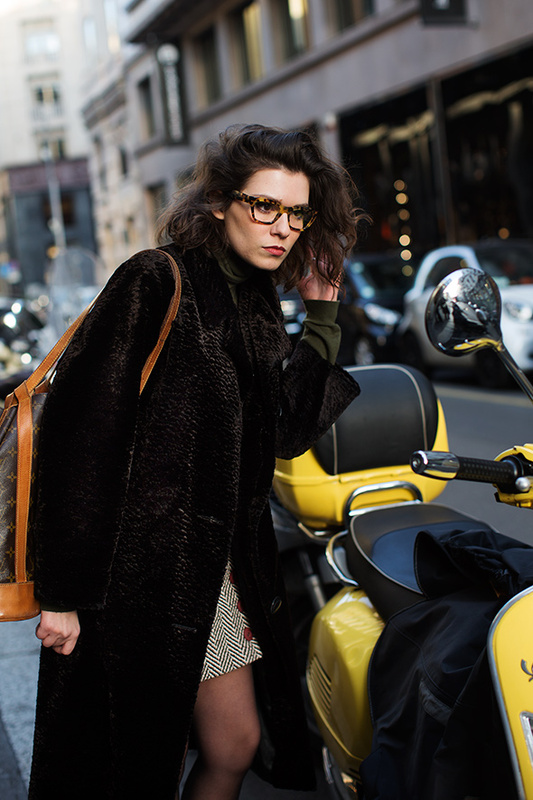 There is such a harmony of color and texture here: shades of brown with tortoise alongside classic LV monogram print, mixed with the astrakhan coat and the chevron wool skirt. An offhand vintage look that’s really compelling. Those glasses so beautifully frame her face. Do u all think she got off that moto or is she just checking in the mirror (perhaps before meeting her man)? ?